I told myself the boys would share a room, our little girl would have her very own room and then we would have a guest room. For all of our guests. Somewhere down the line, in between all the baby years and preschool years, moving things around, collecting an insane amount of toys and every other item we don’t use, my guest room turned into what my hubby refers to as the hurricane room. Well last week I finally decided to take back my guest room and purge. My poor hallway looked like a landfill. In the room before we had a bed that my mother let us have, but it was way to big for the space so we gave it back and downgrade to something that looked like it belonged in the room. Not forced. As you know I’ve been working with BHG this year and giving you all a little look into their line at Walmart. Not matter your LOVE/HATE relationship with them I think we can all appreciate a GOOD DEAL and that’s just what their partnership brings. You saw a few months ago when I scored this beautiful bedding for my little girls room right? Oh and remember the blankets I got for 10 bucks for all the teachers this year for Christmas? Well I also searched, surfed and found this beautiful headboard for the room. It was only $150 bucks! Destiny, do you hate color? So here’s an example of what I mean. Blue as the pop of color and just about everything else in the room is neutral. Along with texture from the bedding…which you can also get a Walmart…link below. and empty frames. the room still feels cozy. I also need a cabinet or dresser here. I’ll make sure to keep you updated on the progress of the room! If you want to find your own BHG product treasures at Walmart then I have a $100 gift card to giveaway to one of my readers! Just let me know in the comments below what you would get from the BHG Walmart Line! PLUS TWO more ways to enter below! 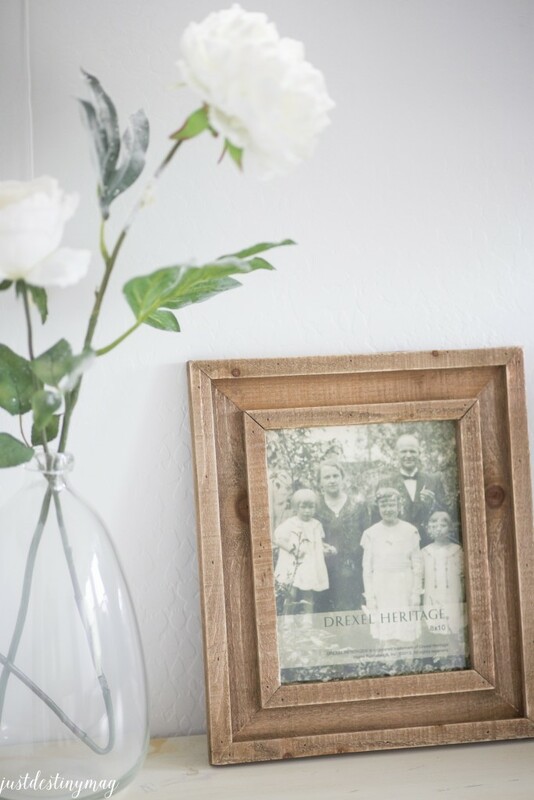 Here are a few of my favorites including some of the bedding I used from BHG! This is a sponsored post brought to you by BHG Products from Walmart and the Live Better Network. 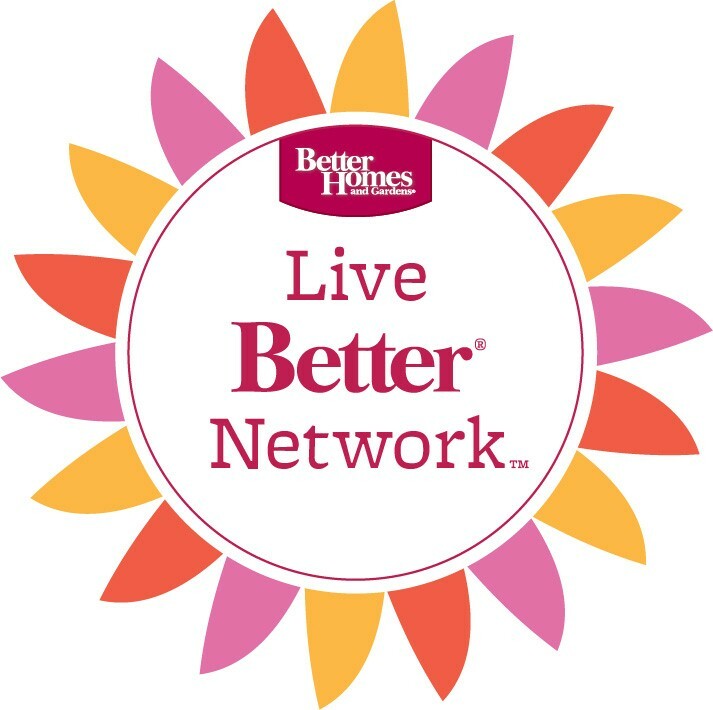 I’m so happy to be apart of the BHG Live Better Network. All ideas and opinions are my own. Follow BHG on Twitter, Facebook, Instagram and of course Pinterest. The Ashwood Road 5 shelf bookshelf is perfect for our living room. We need something to display pictures and cookbooks on! Hard choice, we need new everything! But probably towels, for every bathroom, and a new shower curtain. 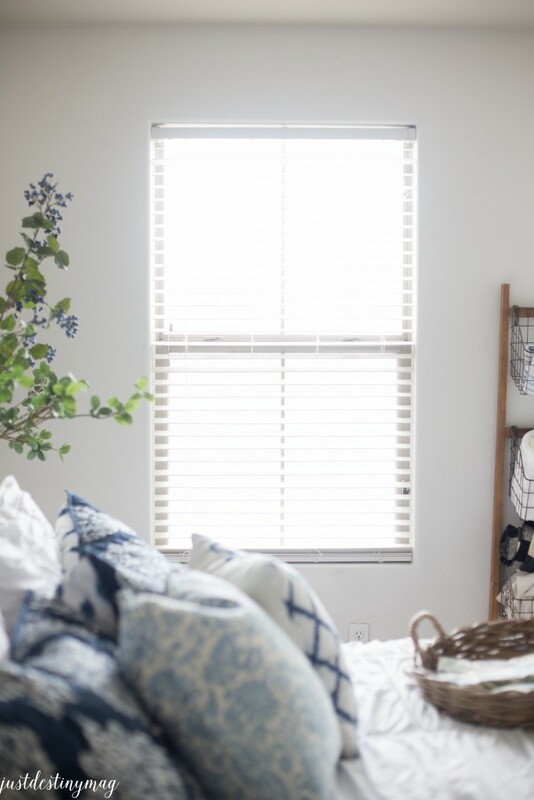 I would buy window treatments for our newly redecorated master bedroom! I would love to win the gift card. 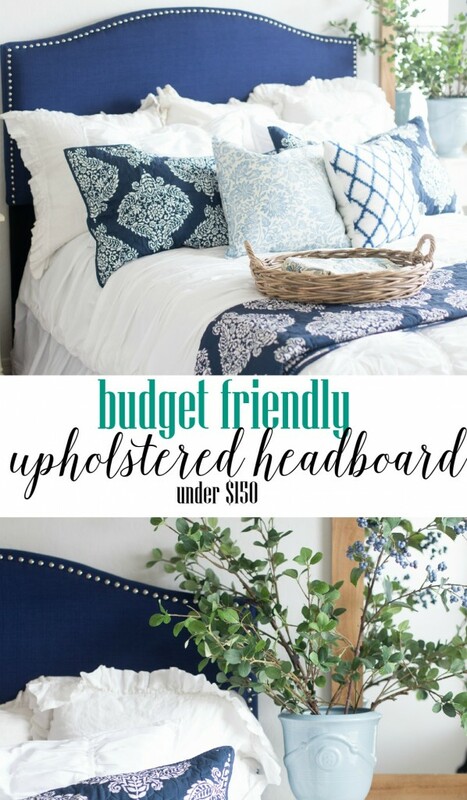 My daughter & I were looking walmart’s upholstered headboards for her dorm room this Fall. Seeing your guest room may have just sealed the deal! It’s beautiful! I am in love with this headboard. I was so happy when I snagged the comforter set you used on Livy’s bed. I literally went out the night you posted it and grabbed two for Chinezes bunk beds! Who knew you could score sonic at Walmart! This baby is divine:-) I hope I win!!! I have a weakness for pillows and love the gorgeous ones you bought. I would definitely use my gift card for some home decor items. Most definitely I would buy this same bedding! I love the bar cart!! I would order the upholstered headboard! I love your bedroom! I would love to get the rustic bookshelf. 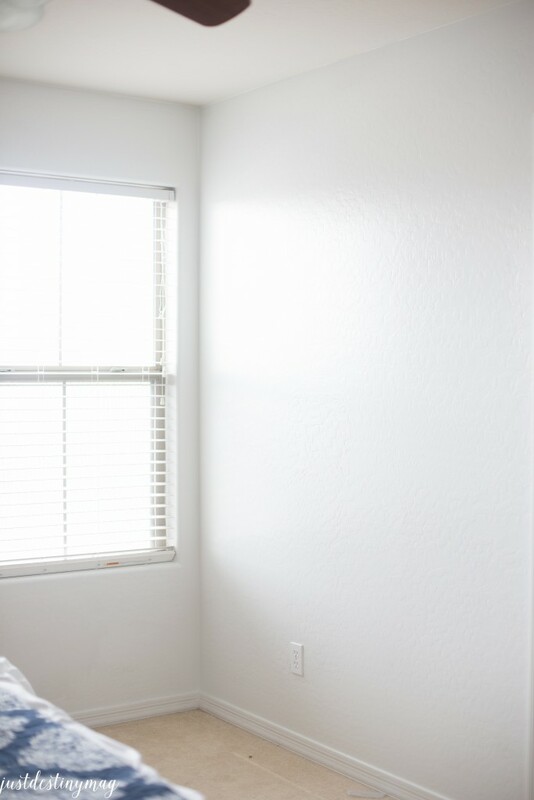 Im so inspired by your little girl’s beautiful room! I’d use the gift card to update my daughter’s room as she transitions from my little princess to my big-ger little princess ;). I love the new ruched bedding…it’s sooo cute and would be great that will grow with her. I love the wicker baskets, frames, and fun pillows! 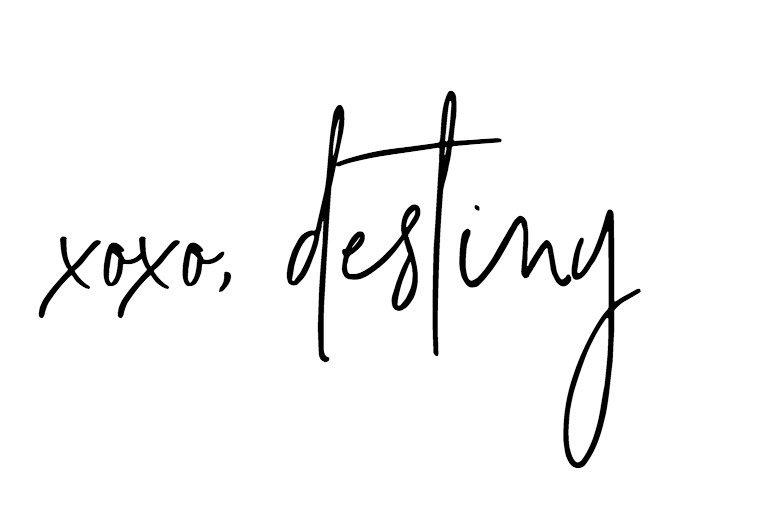 Oh my goodness, Destiny! I don’t even know where to begin with what I would get from Walmart. You did such an incredible job that if you did not share, I wouldn’t have known some items were from there or at such value! As I was reading your entry, my shelf next to me collapsed and everything is about to fall but it is being held by my tightly squeezed books! lol So I would probably start off with a nice shelf for my books and some fabric storage cubes for miscellaneous items. I don’t have a couch, nor do we have room but I would like some foldable cushioned chairs so I don’t have to sit on my hard chair in the 250 feet apartment of NYC! Lastly, I would like some new bedsheets! Holes are just a big no-no. You’re an inspiration – thanks for sharing all your brilliant ideas! i would start with a headboard. 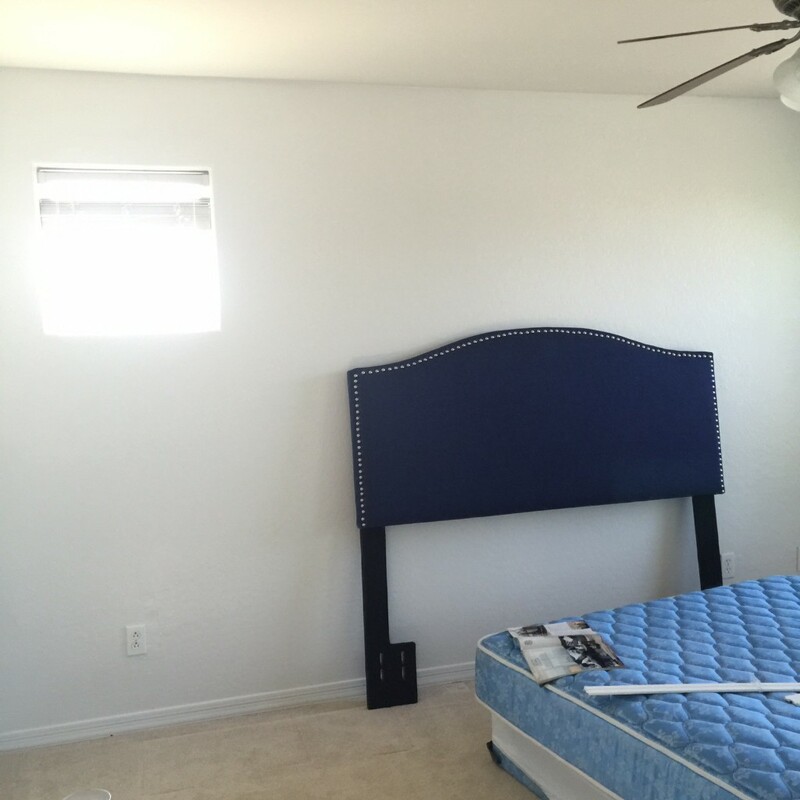 I’m looking to redo my bedroom. Loving the blue…great voice! 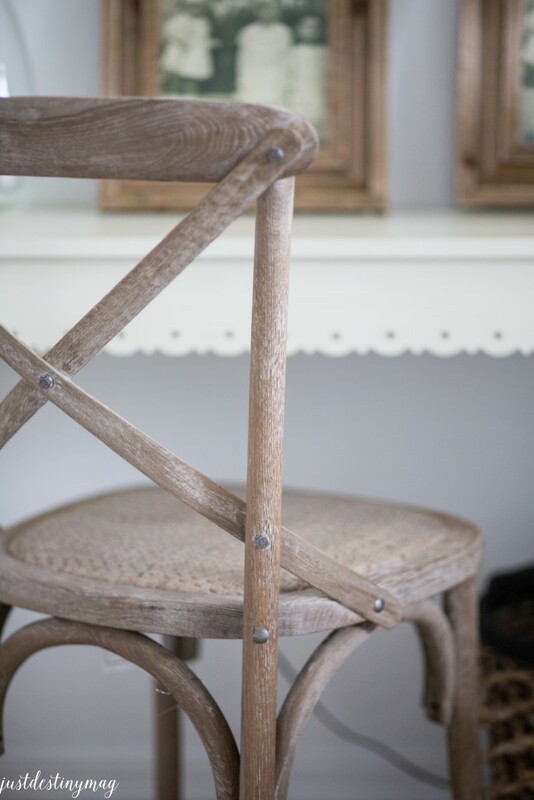 I love love LOVE the rustic country antiqued tv stand! WE HAVE THAT SAME HEADBOARD BUT IN GRAY, AND WE LOVE IT! SUCH AN AFFORDABLE CHOICE THAT LOOKS REALLY NICE! I would love to buy some pillows and accessories for my living room. Lovely! That is my favorite headboard! 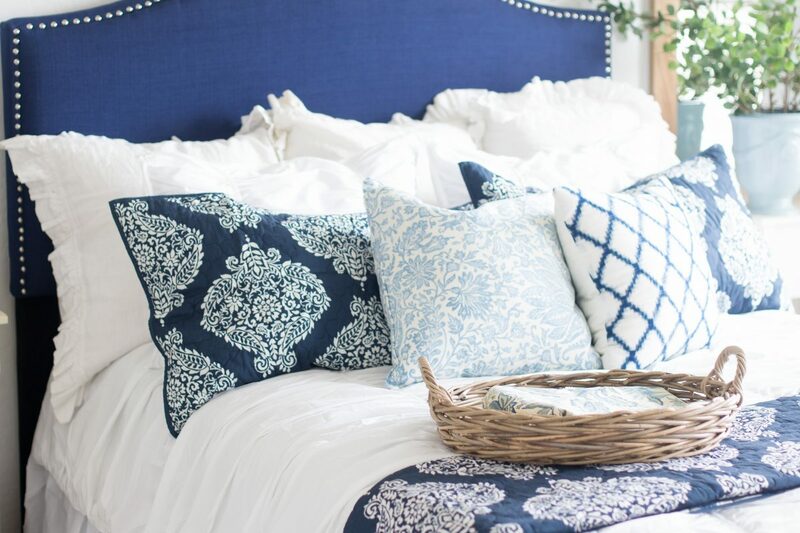 Love the bedding here- where did you get it? 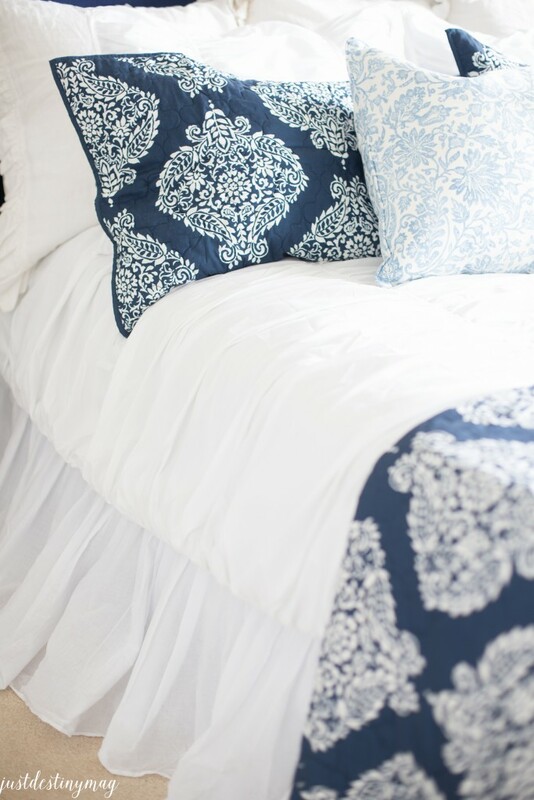 I would use it to continue my master bedroom overhaul- looking for a cute navy accent quilt as we speak! Its from Walmart:0) Better Homes and Garden line! 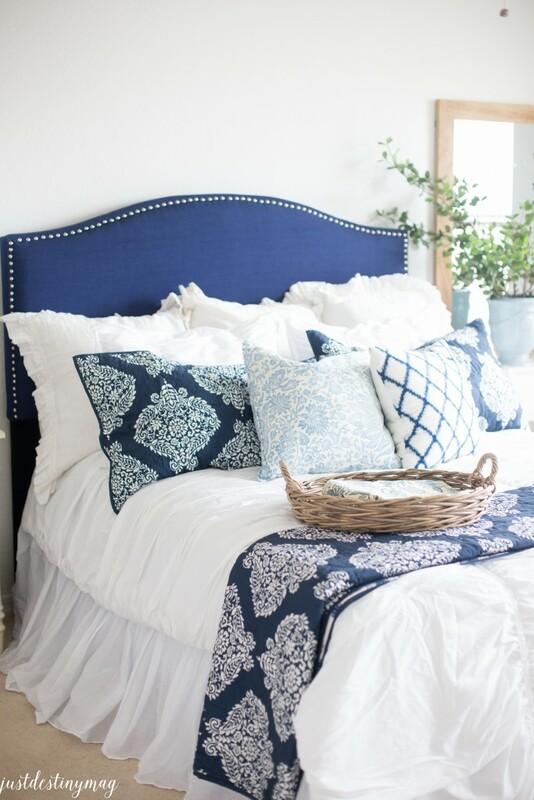 8-14-15, I cannot find that navy blue and white bedding anywhere on Walmart.com…….please help!!! I also have looked high and low for the blue and white bedding and I cannot find it. Can you help me? Those are the colors of my bedroom.